Guzman Landscape and Associates stands behind the work that we do. We provide a one year limited warranty on all of our planting projects. As Unilock Authorized Contractors, we provide a three year limited warranty on all of our brick paver and manufactured retaining wall systems. 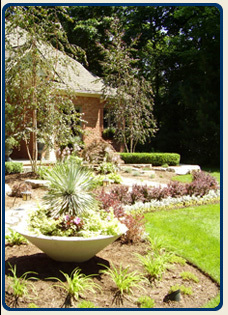 In the summer of 2005, Key Plastics – Plymouth, Guzman Landscaping began working with our team. They have transformed our flower beds into weed-free areas, making an inviting entrance to our facility. The lawn cutting is always meticulous and the debris is hauled away. They have also trimmed our trees and have planted new trees in an area in front of our plant. If you are considering Guzman Landscaping as a possible choice for your landscaping needs, we highly recommend their services. I just wanted to write a note expressing our gratitude for a job well done. You and your crew were professional, courteous, and very accommodating in terms of last minute changes that greatly increased our satisfaction with our new backyard. With the assistance of your design consultation service, your company truly provided a turn-key renovation that has transformed our backyard. Even though the weather didn’t cooperate, you were still done quickly and did a thorough job of cleaning up after the job was completed. If it wasn’t for the beautiful patio that you left behind, no one would even know that you had been there. I am writing again to tell you how pleased I am with the work your company carried out at my property last week. Not only did you arrive and complete the job on time, the quality of work and materials you selected are nothing short of beautiful. I am very impressed with the “extras” you provided to ensure that work is carried out to the highest professional standards. Having seen the quality of your work for myself, it is clear now why Guzman Landscape & Associates was recommended so highly to me by one of your previous customers. Thank you again for your expert work, reasonable pricing, and attention to detail. We cannot thank you and your associates enough for the beautiful patio, walkway and landscaping you did for us this past spring. Your attention to detail is what sets you apart. You took the time to lay out our patio so the color pattern was beautifully dispersed. Your design suggestions turned our backyard into a paradise that we enjoy so very much! You did all of this and more and met our time schedule even though we kept coming up with additional projects for you to do. You really went above and beyond when you repaired the mess another contractor had made of our front lawn. Your associates were hard working and courteous and always left the site neat and orderly. Your salesman, John, did a wonderful job too, following up and making sure everything was done to our satisfaction. Please feel free to use us as a reference. We have already recommended you to some of our friends. Mr. Guzman’s work is excellent. He has helped plan, execute and maintain our landscape for many years. He is timely, honest and the results are more than expected. I highly recommend him.